My boyfriend is a funny creature. Ask him what his favorite food is, and he’ll say, “Sushi.” Ask him where he wants to go for dinner tonight, and he’ll say, “Sushi.” Ask him what he had for lunch yesterday, and more often than not, he’ll say, “Sushi.” And yet, when we go to our favorite sushi boats restaurant, it’s not the sushi that gets him excited. 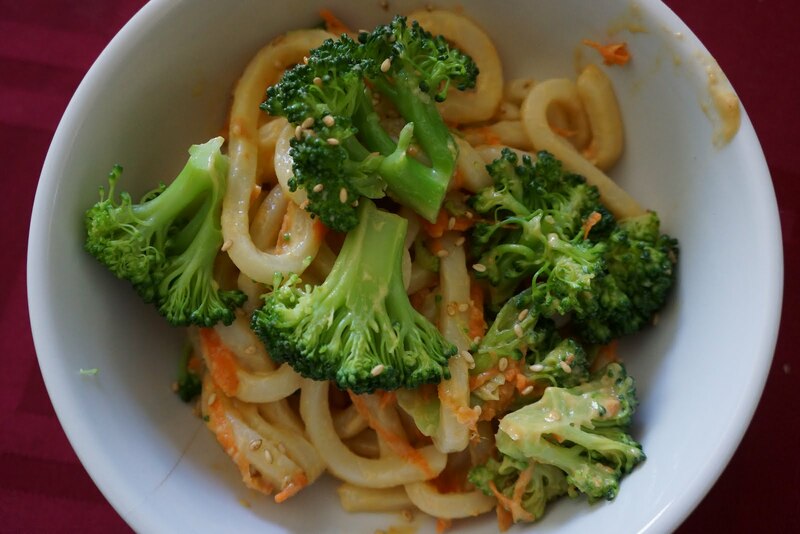 It’s the vegetable udon. I don’t blame him. At this particular restaurant, it’s sublime–shiitake mushrooms, zucchini, carrot, Napa cabbage, noodles, broth, nothing else. The mushrooms infuse the liquid and punctuate each bite, chewy and meaty and just the right size. 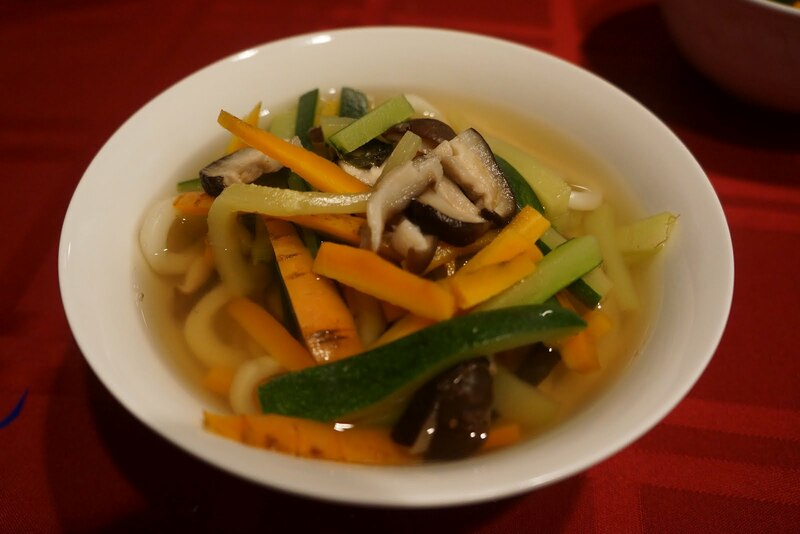 The carrot and zucchini are julienned, and the cabbage is thinly sliced, so that they mimic the slither and slip of the udon noodles. The broth itself is soft and subtle, ideal for letting the fresh flavor of the vegetables burst through. It’s deceptively simple, and of course it was only a matter of time before I tried to recreate it at home. The result? A quick-cooking, feather-light soup, perfect for dinner on a cool summer night. There are not many ingredients here. The key is a lightly-flavored broth, or dashi, and vegetables that are cut to maximize textural fun. The dashi itself couldn’t be simpler: a couple sheets of konbu–dried Japanese kelp–and a handful of shiitake mushroom stems, tossed into a bowl of cold water and left to soak overnight. The biggest challenge, unexpectedly, was finding the konbu; I got lucky, and knew of a Japanese market that sells it in resealable packs. If you can’t get your hands on konbu, you could use a very lightly-flavored vegetable broth. As far as the vegetables, if you have a mandoline with a julienne blade, you’ll fare way better than I did. My knife skills are…well, lacking, and so I ended up with fat matchsticks instead of thin ribbons. It wasn’t a crisis, of course, but I did feel like the chubby vegetables competed with the noodles for attention, rather than gracefully flanking them the way they do at our sushi boat place. But that’s what happens in a home kitchen–things are coarser, stubbier, chewier and stranger than in the restaurant that inspired them. And that, I guess, is the whole charm of taking restaurant recipes like this one home.